We got gourmet sandwiches. We also got gourmet burgers. Hey, we even have gourmet hot dogs. So what's next? Gourmet BBQ Pork Buns? 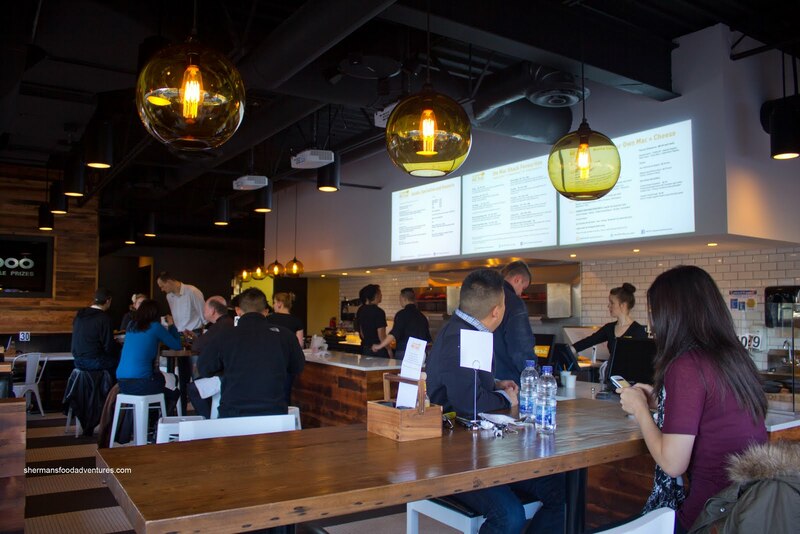 Then why not gourmet mac 'n cheese? Well, that is not really a new idea. Seemingly always behind with trends, there has been funky versions of mac 'n cheese for awhile. 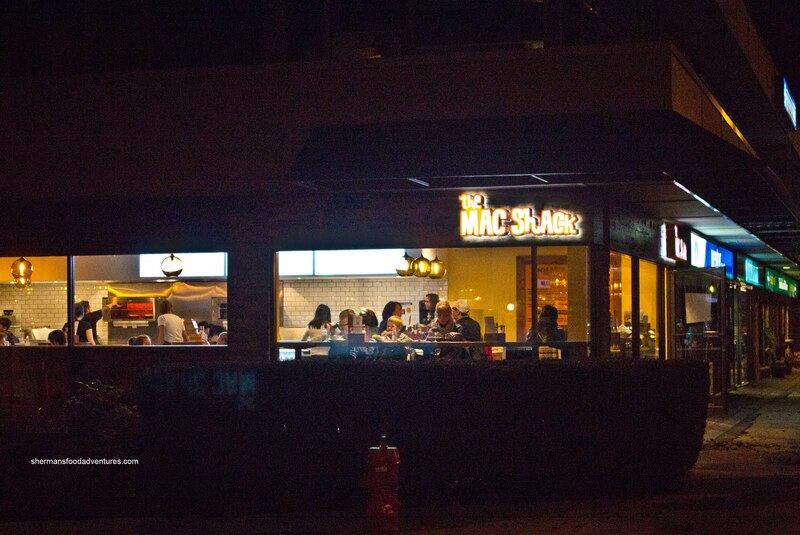 S'Mac in NYC comes to mind. 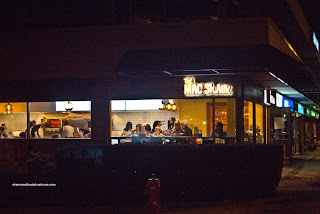 Now in Vancouver, The Mac Shack intends to make it work out in Kerrisdale. Located in the former Vivo! Gelato storefront, The Mac Shack only serves one thing. 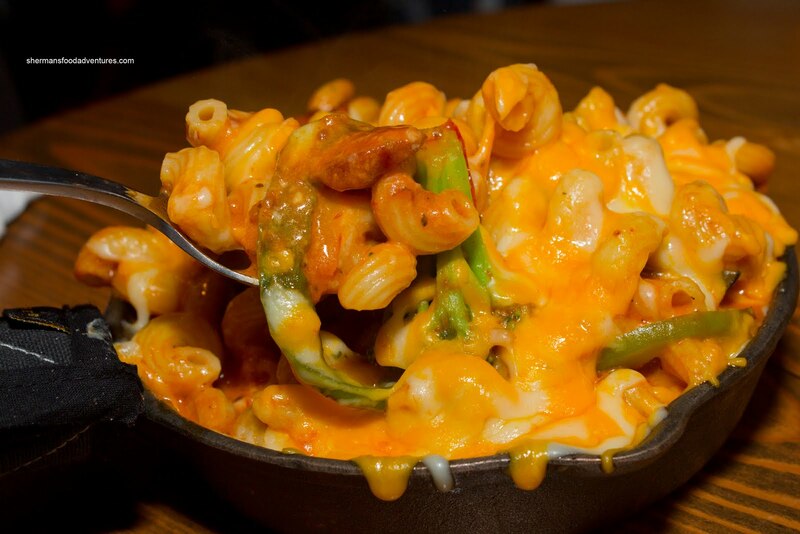 You head up to the counter, pick your mac 'n cheese, the size and take a seat. Joining me on my food adventure was TS of Eatingclub Vancouver, who doesn't venture far from the Westside of Vancouver for eats. It is like there is a psychological wall at around Main Street for her... I dread the day when I need to find a restaurant that satisfies both her and Rich Guy. Therefore, I knew she would be up for this since it was West of Main Street. We ended up sharing 3 orders of mac 'n cheese because I really wanted to get a taste of the place. 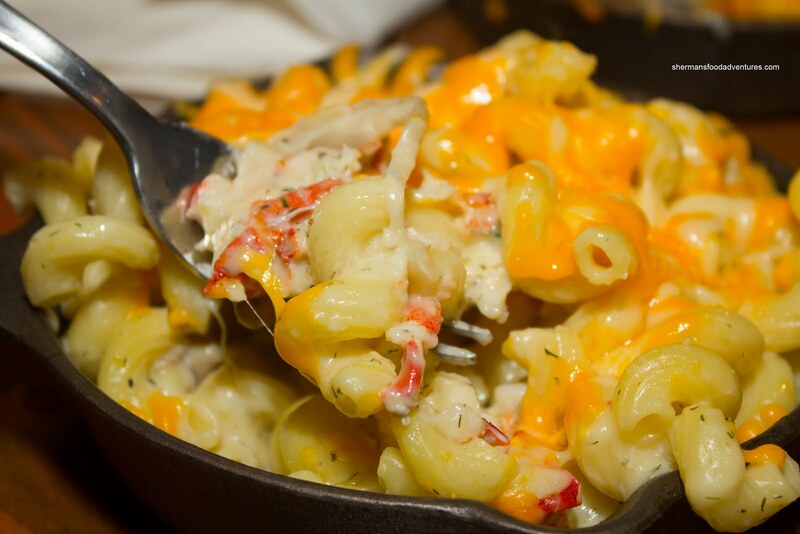 The Lobster Mac 'n Cheese was on the top of my list, so I didn't hesitate to order it. There were 3 sizes available: regular, ultimate and jumbo. The regular was just enough and probably more than one person needs to be full. The other sizes are for sharing, or in Mijune's case, all for herself... As expected, there wasn't much of a lobster presence. Hey, at $12.00 and located in Kerrisdale, I wasn't expecting it either. What I did get a lot of was Earthiness from the truffle oil and oyster mushrooms. So much so, that was the predominant flavour. We found the whole thing a bit dry and not very cheesy. Therefore, it bordered on bland and really needed something to brighten the dish up. Personally, I would've liked to see more of the lemon dill. The acidity would've gone a long way in livening up the flavours. The noodles themselves were somewhere between al dente and soft. TS went for the Ultimate, which consisted of bacon, bell peppers, broccoli, mushrooms, chicken, chorizo and shrimp with Mozzarella and Gruyere cheese in a tomato sauce. Despite the presence of so many ingredients, we found the entire thing to be flat. The cheeses were of the mild variety and we really thought the bacon and chorizo would provide the necessary hit of flavour. Unfortunately, there wasn't enough of it to make an impact. I did get the flavours of the bell peppers though. Due to the large quantity of sauce, the noodles became a bit soft. And once again, there was a lack of cheesiness. Lastly, we shared the Brooklyn which boasted Naramata Blue Cheese and AAA Sirloin Steak, caramelized onions, mushrooms in an aged balsamic reduction and rose sauce. Now that sounded like a flavour explosion waiting to happen. Nope. Failure to launch. Again, the flavours were flat and the worst thing of all - the dish was lukewarm. Once again, there was an abundance of sauce, yet no cheesiness. No sharpness from the blue cheese and no rich flavour from the balsamic. On the positive side, the steak was tender and the portion was large. Upon leaving, it dawned on me that I never tried the Classic made with sharp aged White Cheddar. That would be the baseline of sorts. So I returned a few days later and got it for takeout. For good measure, I also got the Bacon Cheddar Cheese Mac. I found them both to be slightly dry in need of a bit more sauce. Flavours were mild, yet pleasant. It was an okay mac 'n cheese which my kids loved. And that brings up an interesting point: it truly depends on expectations. For myself, I was quite indifferent. Not great, not horrible. 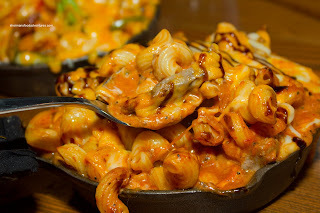 I loved the concept and the mac 'n cheese options, however, the consistency and recipes could improve. If they can boost the flavour and refine the execution, we could have a good product. 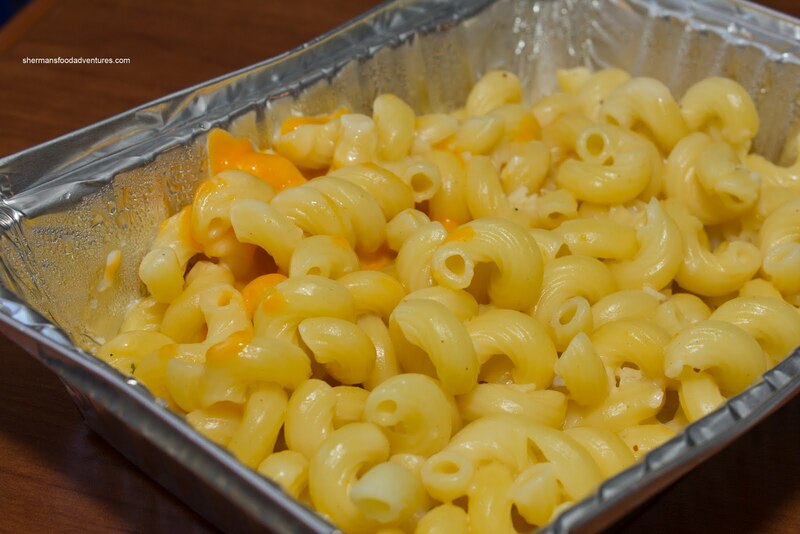 It may involve raising the prices, but I'd gladly pay more for a better mac 'n cheese. The best mac 'n cheese I've ever had is actually from Safeway. It's a premade tray from Reser's that you can either bake or microwave (found in the meat section of the store). It's so freaking good. They also make scalloped potatoes and a baked hashbrown gratin. Honestly I usually find all mac 'n cheese to be rather bland but this was excellent. Try this (usually on sale for $3.99) and compare it to $12 + mac 'n cheese you get at a restaurant. @Jade I don't doubt you. Sometimes the best food can be found frozen. Despite what some food snobs would lead people to believe. @KimHo Thanks for the tip. I'll be sure to try it out next time I make it down there. 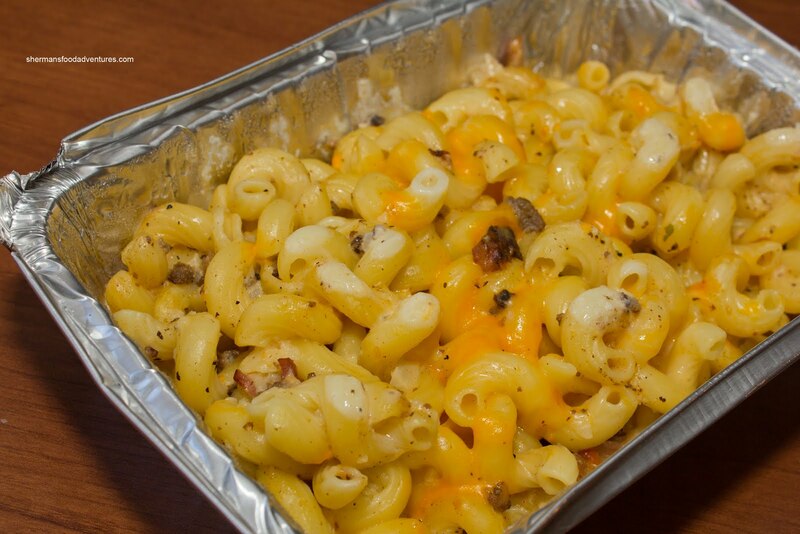 Well, I think the owners of the Mac Shack have more to worry about than the cheese they use. They need to improve their recipe pronto.